Only a couple more snippets before you can buy the whole thing and gobble it up all at once. As always, to begin at the beginning, click here. She hugged him back and I thought I heard a small sigh, before she gestured at me as he let her down. Mark surveyed me with dark hazel eyes as he took my hand briefly. Then I looked up at Tex, who had to stoop a little to shake my hand. He was taller than her grandfather, a skinny rake of a man in greasy coveralls. “You’re our ride out of here?” I surmised, and he grinned. “Tex!” Bella interrupted. An old-fashioned girl, that one. But inside sounded good. Maybe there would be food, too. I followed the girl in, content to let the men wait chivalrously for us to go in. They may also have been assessing me for threat, not that I gave a damn at the moment. I’d seen that Mark was of Lavendar’s blood when he’d hugged Bella and their lifeglows were identical. I was safe, for values of safe. In the building was a large waiting area, a universal design and decor, and on the counter where tickets were no doubt sold from, were two large pizza boxes. I headed for them. Mark grabbed a stack of paper plates and handed Bella and I each a slice of pizza. “Fast Eddie’s Mad Trapper Pie.” He announced cheerfully. I didn’t care what it was called, I needed it. I was already taking a bite. It was good. Spicy – my mouth was already burning, but hot and greasy and perfect. Mark watched me eat, and slid another piece on my plate before I could even ask. I was most of the way through that piece before I remembered what I needed to ask. She looked startled. I guessed it hadn’t crossed her mind, just like it hadn’t really sunk in that she was leaving home. “Yes, but…” she turned to Mark. “It is in my cabin, and I don’t know how we will get it. Some clothes and things would be nice.” She looked back at me, a pleading expression. “And the cat. Who will feed him? I interrupted. “Whoever goes needs to use caution. And I need to get my case off the snow machine, dammit.” I had completely forgotten it in my need to get food in my system. That wasn’t good. I could not let my guard down like this. I knew he hadn’t tried to open it. If he had, there would be some melted snow outside. The elaborate tooling on the case was for more than decoration. I patted it and went back to eating. Mark adopted an expression of abused innocence while I watched the byplay with amusement. They were more like siblings than most cousins. I went back to eating while they talked to Dan on the counter phone. “Where?” I was surprised at how many feathers the old spirit was sticking into the pot. Bella must be something special to him. “Not my cohorts.” I felt utterly tired, now, but the warm glow in my stomach was soothing my unsettled humor. I rubbed my face. This was not going to be easy. I wasn’t supposed to tell Mark, an outsider, anything. Oh, hell, he is Lavendar’s blood. Mark got up and brought the pizza over and put it in front of me. I nodded my gratitude as I took another piece, and went on. I stopped to finish eating. I needed the fuel badly, still. I took another piece. Mark gave her a startled look. Raven must not have told him about that fight. I swallowed. The pizza was very good, but I was eating too fast to appreciate much. Tex materialized and handed me a bottle of soda. “I am not convinced it’s the Winter court alone. I know they have allies, and some of them may be Summer Court, I’m sorry to tell you.” What I wasn’t going to tell her was that I trusted no-one. Not even her sweet, innocent little face. It might look to them like I was only talking, and stuffing my face. I was also watching their every reaction to what I was saying. Mark was looking slightly concerned, with protective glances at his cousin from time to time. She might think of herself as competent and independent, but she had a pack of family who looked after her. She nodded, looking a little pale. I picked up the last piece. “Do you always eat like that?” She followed the arc as I lifted it to my mouth and took a big bite. I nodded. Not much more I could say, to that. The door swung open and I was on my feet and between her and the newcomer before Mark could even look around. I relaxed, recognizing the man stamping snow off his boots. While I was up, I grabbed the other box, the one with half a pizza left in it. Dan brought a thick envelope and a backpack to Bella. She stood up and hugged her cousin, and he glared at me over her shoulder while he rubbed her back. I nodded at him, acknowledging his anger and frustration. The burly, bearded man rather intimidated me, and he didn’t have a bit of magic. Bella kept her face turned away from me when she let go of him, but I could tell from her hand movements that she was wiping her tears away. Dan came to me. “Anything else we can do?” He asked me in a deep, quiet voice. I shook my head. The food had me alert again, and now I had to think through how we were going to get safely away from here, without any collateral damage. We needed to leave, soon. My power signature was damped, I knew, but she had no such training, nor did Mark. I mentally debated taking him with us. No – they would leave him alone, he was male and posed no danger to them. She had a right to snark at me, I had eaten a pizza and a half, it looked like. “Remember to have food on hand when you learn to do that. Then you will understand.” And I was looking forward to training her, and getting a chance to prove it to her as she tossed back the calories afterward. “I’m going to be able to toss a snowmobile?” She grinned. 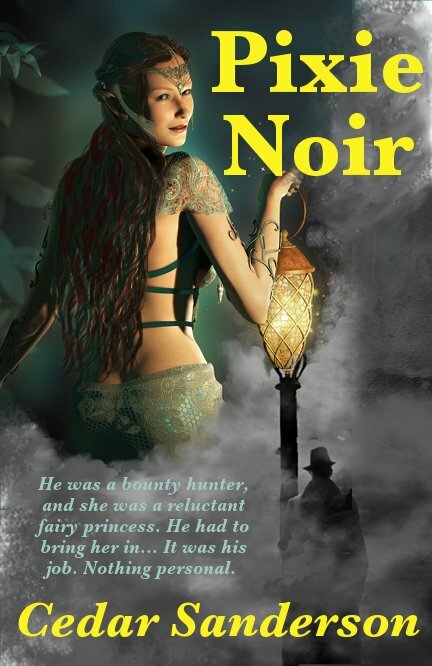 Tags: Contemporary fantasy, cover art, Pixie Noir, snippet. Bookmark the permalink.